I’d say my heart grew three times, but then I’d be in the hospital with an exploded rib cage. Sometimes it’s nice to see good things happen to good people. I don’t think it’s an exaggeration to say that My Love Story! has been the bright spot in my week for the past six months. My Love Story! is the tale of Takeo Goda, a hulkish high school student with a heart of gold, and his romance with the young girl, Rinko Yamato. The series started in Spring and very early on made it into our list of must-watch series of the season. After an incident where Takeo saves Rinko when she is molested on a train, she comes to visit him and his best friend, Makoto Sunakawa to thank them personally. Takeo is instantly smitten with Rinko, but after a years of playing second fiddle to his more handsome friend, Makoto, he mistakenly believes that this new girl of his dreams likes Makoto despite the fact that Takeo is the one that saved her. It turns out that Takeo is wrong and, unbeknownst to him, Rinko has fallen in love with him at first sight. It is at this point that most sitcoms would hit the brakes and spend an entire agonizing series of “wacky” will he/will she antics with two characters who are meant for each other, obtusely oblivious to each other’s feelings. But that’s where My Love Story! does things right. Almost immediately, Takeo is informed of the truth and the two quickly begin their happy high school romance. The story takes off and only gets better from there. In a word, My Love Story! is pure. It’s purity and innocence in a modern world where most of us have gotten used to lies and betrayal. And yet, it’s earnestness in its purity keeps it from being unrealistically saccharin. Everyone looks up to and loves Takeo. But that love and respect is earned, and you see how through his actions. From saving a child who has fallen into a river to running into a burning building to save the people inside, Takeo is selfless and kind. But he also makes mistakes and gets confused in a realistic way. He is perfectly imperfect and despite knowing that there’s no way he could be real, you can’t help but wish he is. As someone who grew up an introverted “nice guy,” I’ve had experiences like this. I too had the popular friend that all the girls flocked to. Every time there was a girl I had the slightest interest in, it was inevitable that she would be with him in no time, leaving me with a sting of rejection and the self-loathing that I was resenting a friend. So to see Takeo want to do everything in his power to support Rinko and Makoto despite his own feelings for her really brought back a lot of emotions I hadn’t felt in a while. So much so that when Takeo and Rinko finally do get together, it was a massive moment of cathartic vindication for me that made me believe that good things really can happen to good people. Throughout the series, Takeo and Rinko are a luvy-duvy happy couple, and yet it never seems to get old. Every time Takeo yells out in his head that he loves her, I would crack a smile. The two are a moment of purity in an impure world, and every time they are faced with a real world obstacle like potential rivals or misunderstandings, they manage to come out on top. The characters are so untainted yet so real that despite being a pessimist at heart, every episode I wanted to believe in them. The English title “My Love Story!” is actually an incorrect translation of the original Japanese and it’s one of the only complaints I have with the series. The original title is “Ore Monogatari!” (俺物語！) which basically means “My Story!” or “Story of Me!” which is a very important distinction. 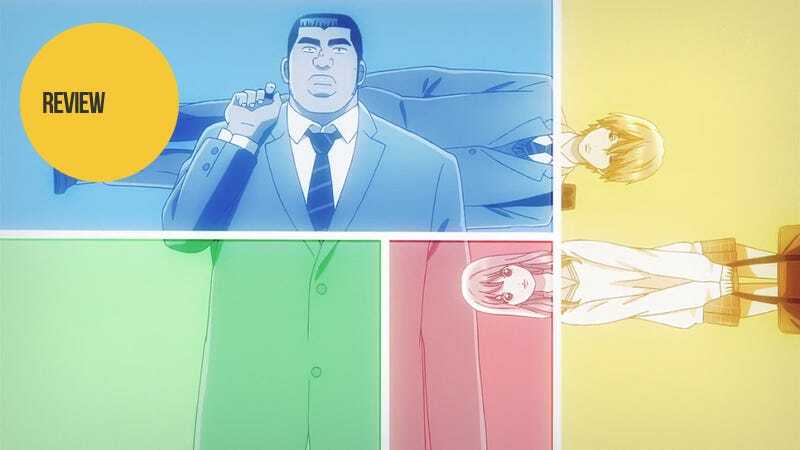 While the series revolves around Takeo’s romance with Rinko, it is very much a story about the people in Takeo’s life and their social relationships, not just the happy couple. Takeo’s bonds with his friends and family are just and important and defining parts of the story. There are episodes involving sickness, birth, heartbreak, and romances other than Takeo’s that are just as important to the series. Takeo’s friendship with Makoto is a relationship that is just as vital as the one he has with Rinko. Two boys who started out as friends simply because their mothers got along grow up to be an inseparable pair with an understanding and respect for each other that makes them almost brothers. The surrounding characters help build the world of My Love Story! and everyone plays a part in helping to define Takeo’s new romance with Rinko. The series is 24 episodes long, and honestly, despite being a comedy, I was brought to tears numerous times. Nothing really feels like filler and after each episode, I was genuinely glad to have watched it. If you want more tragic pathos in your stories, more death and betrayal, this series isn’t for you (and you’re a goddamn monster). My Love Story! is a story of a good man, a good woman, their good friend, and the good things that come to them. In the end, not only was I truly happy for them, but they made me believe I could be as good as them. And for a moment, even the cynic in me believed that other people could too. My Love Story! aired on Nippon TV in Japan. It can be viewed for free and with English subtitles in the US on Crunchyroll and Hulu.